Students from Drexel University in Philadelphia proudly show off their freshly shaved heads at a St. Baldrick’s event held on the university’s campus. On the evening of July 4, 1999, colleagues Tim Kenny, John Bender and Enda McDonnell were chatting at a barbecue when the conversation turned to a reflection on their lives and careers. During the discussion, Kenny issued a challenge to his friends asking how they might give back in return for their own good fortune in business. Bender suggested that McDonnell might shave his head of plentiful hair as a way to raise funds for kids with cancer, and in that moment an extraordinary idea was born. Named after their first event on St. Patrick’s Day in New York City, St. Baldrick’s is today responsible for raising over $100 million in childhood cancer research grants through a grass roots, volunteer-driven movement — springing up everywhere from university campuses to military bases in Iraq. With the participants either proudly shaving their heads or engaging in other fund raising efforts, it’s a cause that has captured the imagination of everyone including celebrities, fire fighters and police officers, corporate CEO’s and sports teams. St. Baldrick’s offers some surprises to anyone discovering the charity. The first is the shocking revelation that although worldwide a child is diagnosed with cancer every three minutes, research into childhood cancers is desperately underfunded. With over a dozen types of childhood cancers, and countless subtypes, the disease frustrates and challenges researchers’ attempts to find cures, as it receives less than four percent of the Federal funding allocated to support cancer research. More children are lost to cancer in the U.S. than any other disease and aftercare for survivors can be complex and costly. That is why St. Baldrick’s seeks not only to fund research, but to also provide supportive care to help combat the problems sufferers may face later adult life. Because of the specialized nature of some of these cancers, adult instances of the childhood strains can record a 30 percent improved survival rate when treated at a pediatric specialty centers. 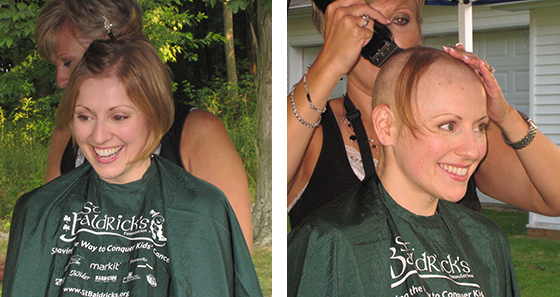 There are other surprises too, such as the way St. Baldrick’s demonstrates the generosity of the human spirit. Bender’s bother Joe first shaved his head back in 2002 while working at the LSU bookstore in Baton Rouge, Louisiana, and as his career with Barnes & Noble College progressed, he has participated and helped organize fund-raising events at Yale University and at his current position managing the bookstore at Indiana University Bloomington. 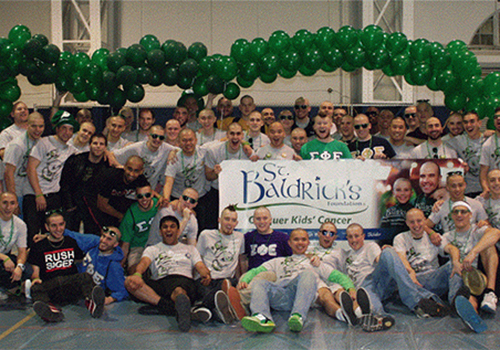 The appeal of St. Baldrick’s on university campuses is particularly significant. “One of the great strengths of the moment is that it provides a way for young people to become leaders,” explains St. Baldrick’s Chief Executive Officer, Kathleen Ruddy. “Students are idealistic at that age; they see the world as they want it to be, and they’re willing to work to make it so.” Ruddy explains it is that characteristic that creates such a perfect fit for St. Baldrick’s, where a lack of financial resources has triggered extraordinary resourcefulness and networking capabilities. “I think students see it as a way to engage their peers, parents, and whole campus communities behind something that’s very powerful,” she remarks. It was that kind of encouragement that persuaded Lisa Loughan, Buyer for Barnes & Noble College, when she met with Joe Bender at a trade show. “I’ve always been interested in charities and I also love a challenge, so when Joe said he’d donate $1,000 dollars if I would shave my head, I couldn’t pass it up.” Having participated in a breast cancer 3-day event twice, and having family members who had been affected by cancer, Loughan learned in her subsequent research on the St. Baldrick’s website that she could dedicate her own fundraising in a particular child’s honor. “I discovered a girl who had been designated as an ‘angel,’ meaning that she had not survived her cancer, and that made me even more determined to do it. I felt a connection to that little girl — that’s what made it personal,” she adds. Lisa Loughan has her head shaved to raise money to fight children’s cancer at a St. Baldrick’s event. Initially choosing a pledge target of $5,000, she quickly raised $4,800 in donations and increased her final goal to $8,000. By the time she shaved her chin-length hair, the donations had added up to $10,000. “Yes, people do look at you differently,” Loughan recalls, after she shaved her head — so much so, that she wore a St. Baldrick’s pin inviting the curious to ‘ask me why I’m bald.’ “It was such an amazing experience, and when you connect it to children, I think that makes you even more determined to help them get past cancer and lead a full life,” she says. Joe Bender agrees. “We have a great opportunity here on college campuses to promote St. Baldrick’s and hopefully get closer to effective cures,” he says. Barnes & Noble College hopes to be part of that opportunity this fall as it develops a multi-channel campaign to drive awareness of the St. Baldrick’s mission and the goal of providing support for children with cancer. “We want St. Baldrick’s collegiate volunteers to know the bookstore is ready to support and partner with them on such a worthwhile and important cause,” Tamara Vostok, Consumer & New Media Marketing Manager for Barnes & Noble College, confirmed recently. For more information on St. Baldrick’s and their efforts to fight children’s cancers, call (888) 899‑2253 or visit www.stbaldricks.org.